" Do not be afraid, I am with you. Remain faithful also in the trials ahead of you. Many undergo severe trials, especially those who neglect prayer or who have utterly given it up and who celebrate the Sacrifice of Holy Mass very superficially. In such priests fidelity to God, to the Church and to the vows begins to break down rapidly. That is why they do not have any strength to care for the chastity of spirit and body. Prepare carefully for reconciliation. Pray for yourselves, that you may be victorious in periods of trial; pray especially for the priestly brothers who are in danger, love them and do not abandon them. Remain faithful to the Church, to your Bishop and to your vows. I will help you, trust in me! I, your Mother, the Queen of Peace, bless you and all those whom you have recommended to me.
" I am thankful to all those who visit me here. I am especially thankful to the few priests who accept my message without fear and I bless them especially. Again, I invite the faithful and priests of the renewal that they may follow me with confidence and realize my messages of Medjugorje and of Kurescek. With special desire I invite all sons and daughters of John Bosco. They shall accept my messages, live and spread them in their ranks and among the people entrusted to them. I wish that the parishes of Zelimlje, Golo and Ig consecrate themselves to my Heart and to the Heart of my Son after careful preparation. The consecration shall be solemn. Afterward the parishes shall renew themselves in the spirit of this consecration and surrender themselves to the powerful wind of the love of my Heart and of the Heart of my Son. The priests, religious brothers and religious sisters who feel the wind that blows from Our Hearts shall become the souls of the family of the Hearts of Jesus and Mary. They shall see to it that laypeople also join the family of Our Hearts. I wish that each week an hour of immersion into the mystery of my Heart and of the Heart of my Son shall take place. All members of the family of the Hearts of Jesus and Mary shall be present at this, if in any way possible. With prayer and fasting prepare yourselves for reconciliation, so that you may share in the peace of God. Pray, pray for peace in the world. Satan is attacking with full strength and is threatening world peace. The Church, too, is being tried severely. Prayer, fasting and a life according to the Gospel are the strongest weapons against the terrible forces of evil. 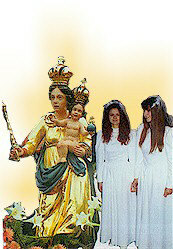 I, your Mother, the Queen of Peace am with you. God is almighty, therefore only He is your peace and your victory. My blessing shall accompany you, especially those who are faithful to me and those whom you recommend to me.
" The crown of the solemn year of the parish of Ig shall be the consecration of the parish to my Heart and to the Heart of my Son. This is the wish of your Mother, the Queen of Peace. I rejoice over the great number of my daughters and sons. I greet you and I thank you." " Praised be Jesus Christ! Beloved daughters and sons! Listen to Lent which is inviting you to conversion. Pray, pray much and support prayer with fasting. Pray for peace and reconciliation. I wish that you live in peace and charity. Be fond of and love one another. Do not observe others in order to notice their weaknesses. See in them what is worthy to be imitated and what God has planted into their hearts. Priests, my beloved sons! I am not offended that many among you do not take my messages seriously, yet I am sad that they do not immerse themselves in my motherly Heart in the way the Church has recommended for a long time. These ones fail to fully profit by my assistance, intercession and blessing. I invite you to encounter me in prayer and contemplation. Immerse yourselves in my Heart. I rejoice over the great number of people I see coming to meet me. Your visit with me is the sign that in their hearts love and trust are growing, therefore I bless you. I bless also all whom you have recommended to me and for whom you have prayed. I am thankful for your fidelity, yet I am sad because of those who could have very well collaborated with me in the preparation of the meetings of reconciliation and who could have shared my desire with the world. But they have abandoned their collaboration with me and with those who desire from their hearts that my wish be fulfilled. I ache from the mistrust, the doubts and the lack of seriousness regarding my messages. Even though there is so much lack of seriousness many people will experience the grace of reconciliation: in many a family peace and fidelity will return. My fervent desire for reconciliation will be enkindled at Kurescek and at my other shrines, where the seekers of peace and reconciliation will take refuge. I am indeed the Queen of Peace. I rejoice over your collaboration with me and with the grace of God, yet I am sad because of your coldness and lack of seriousness. He who does not collaborate will not be lost, yet he will not be fully open for many graces. My beloved sons, the priests, I invite to collaborate with me. They should be on guard against the tricks of Satan, and especially against the means by which Samson was led astray. Be my faithful children, I will help you. Be courageous even though you are few, I am with you. Carry my blessing into your houses and wherever you live. I rejoice that so many lovers of my Son's Heart have come to me and have listened to my invitation to reconciliation. I will pray for all of you who desire reconciliation, for all of you who wish to forgive, and who wish to receive forgiveness! I will pray for all of you who have gathered here and for those who in any other place lift up their hands to my Son and who wish peace for themselves and for others. Kurescek and all my shrines shall be places of reconciliation and thanksgiving for the peace received. All of you who seek reconciliation should also perform sacramental reconciliation. Forgive, so that you may be forgiven. Strengthen yourselves with the Body of my Son! There are some among you who did not come here because of reconciliation; they will leave here without my blessing. Priests, my beloved sons, I wish that you may immerse yourselves more and more into the significance of your vocation and know what kind of work you are performing in the ministry of reconciliation. Put all of your heart into this sublime, grace-filled ministry! All of you who are gathered with me share in my blessing and peace. Reach our your hands to those whom you forgive, so that they too may forgive you. If you cannot reach out with your hands to someone, reach out with your hand in spirit following your desire. Carry my peace to all people and share it. I bless you and I give you my peace. Kurescek, May 4, 1991. The Way of the Cross, at the thirteenth station. Dear lovers of God's peace and justice, surrender through me all hurts caused by the injustice other people have inflicted on you or that you have inflicted on others, and by the incapacity to forgive. You will receive strength and love and you will be able to forgive. Drink to your satiation the divine peace coming from my Heart and from the Heart of my Son and also share this peace with others. If you bless all those who do not like you, you yourselves will be blessed. Care for the presence of God in families, and peace will be among you. I rejoice because you have overcome the difficulties of bad weather, for the sake of love for me. I will pray with you, so that my Son may bless you abundantly. Priests, my beloved sons! in my Heart is joy, for you are also here in the ministry of the Sacrifice and Reconciliation of my Son. Pray for your brothers, the priests, and also for those who do not understand you, who oppose you and judge you. Love one another and be careful shepherds and doctors of the souls who are entrusted to you and who come to you for medication for their souls. With a joyful Heart, I bless you. I bless all those whom you forgive and those whom you have forgiven. My heart is full of joy because love has the victory in you, so that you can easily forgive and seek strength in the Triune God. With a joyful heart, I pray for you, for you are my children. Today I have a special wish for reconciliation for you: Forgive, I wish that you finally forgive your priests if they have ever harmed you, and if you in any way do not like their way of treating you. Forgive them if perhaps they have not been zealous enough and if they have not always been a good example. Pray for them, for through them you receive grace after grace. Even the thorny tree can bear beautiful grapes at the side of the fruitful vine, because the vine embraces it with its branches. Be one with your priests as the Heavenly Father is one with the Son. The members of the Body may not be separated from one another. Also for you I have a special wish. Forgive your Bishop, if you have ever taken offense in him and also forgive one another. All of you are workers in the vineyard of the One Lord. Be humble, and also forgive your little sheep who are disobedient. Disobedience is a sign of disease, but for such persons medication is needed. With great joy I will assist you and pray with you, so that you stay one in the Mystical Body, the Head of which is my Son. Love one another, be patient with one another and forgive one another! I rejoice with you and I bless you! The joy that I feel because of your love for me and for my desires will be rewarded with rich blessing and peace in abundance. All of you will be living witnesses. The priests who came to this place to celebrate the Holy Sacrifice of Mass and who are in the service of reconciliation are a special joy for me. All you who are endeavouring for reconciliation, receive the peace of my Son who is the only Way through which you can satiate yourselves with the Truth that frees you and leads you into Life. He who does not enter this Way will not participate in Peace and Reconciliation, will not strengthen himself and will not free himself through Truth. If you want to share in Life and enter into it, renounce your way and your truths. I will always bless you, even when some sadden me through lukewarmness, disbelief and disobedience. Today I bless all of you with great joy. Carry my blessing to your houses and especially to those who have recommended themselves to your prayers at this place. May my blessing and peace strengthen all the sick who have come here and all those who want to visit me in my sanctuaries but cannot do so.
" I bless all the many lovers of my Heart and of the Heart of my Son who have visited us at this place and at other shrines. Many lights of reconciliation have been enkindled. Continue to enkindle further lights of reconciliation and peace! All of you who during this month have found peace and reconciliation with yourselves, with others and with God, are to be my living witnesses. The deeds of reconciliation are not accomplished. Continue, pray for forgiveness and witness love to one another through acts of reconciliation. I will assist you and also wait for those who have not yet found the way to my Heart. I rejoice very much over all those who in humble love serve reconciliation and who enkindle lights among the priests and the faithful. I rejoice over the reconciliation among you in relation to the Bishops and to all men. Do not extinguish this fire! Do not be downcast because of the wounds, the humiliations and the mockeries caused by the fact that you are devoted to me. You who have felt the working of my Heart are to become witnesses of my love. I will reveal myself to the others. May your experience of reconciliation be transformed into a great fire of love. Bear witness to me through your deeds! Joyfully I bless you. Carry my peace with you. I bless all those who have recommended themselves to you and for whom you have prayed. My dear sons and my dear daughters! I greatly rejoice over all of you who with faith take refuge through my Heart in the Heart of my Son. Again I ask you to nourish yourselves with the food that will satisfy you so that you will not hunger any more, and to drink to your satiation the living water so that you will not be thirsty any more. Only by the power of this food and this drink will you discover the secrets of my Heart and of the Heart of my Son. This you need, in order to walk along this path and to reach its end. Great poverty is in the souls of all those who do not know the treasury of Our Hearts. I invite all daughters and sons to love one another and to love their priests. Come to me, I will always be with you. Do not feat the dark clouds. I am thankful for your obedience and your trust. Enkindle the torch of love for my Heart and for the Heart of my Son in other priests who are still lukewarm towards me and their priestly ministry. This causes great pain to Our Hearts. I am thankful to all those who accept my invitations. Many among whom you live need the light; mediate it, become a light! I, your Mother, am with you. I bless all and pray with you for those you have entrusted to me. Remain my faithful children.
" O blessed peace, that my Son gives to you these bad days because of my intercession. He who experiences unrest during this trial should pray and his heart will find rest, and he will gain trust in my intercession. Forgive and strive for peace and reconciliation. In your souls the call of John the Baptist shall resound: "Convert and repent!" When you have converted, the Kingdom of God and peace will be among you. Renew prayer in the families. Unite yourselves in prayer-groups, both small and big. Do not call down the wrath of God upon your enemies, but bless them and pray for them. Even if they consist only of two persons, prayer-groups are focal points of graces and little lights for those who are in darkness. I rejoice over the great number of my children at this place of peace, because your love for me has overcome the fear that Satan has sown among you. I wish that you gather on Kurescek, August 5, in order to praise the Father, the Son and the Holy Spirit and to give thanks that I am your Mother. Do not be ashamed because of my Son's Name and of my Name. I bless you, trust in me.
" Dear lovers of my Heart and of the Heart of my Son! Again I invite you to pray more for peace. If all of you who belong to the Name of Christ were true lights, there would be more light among the people and also among the powerful. Surrender yourselves through my Son as the complete possession of the Father, so that he may transform you and shine through you with the light of salvation. Pray, pray for the powerful who threaten with the weapons of hatred the lives of those whose Landlord is GOD. They destroy and kill because they are in darkness. Pray for true wisdom for them, so that their conscience may be awakened in them so that GOD may order their decisions. Unite in the families of my Heart and of the Heart of my Son. The Father has put into the Son's Heart the unending, inexhaustible treasure of grace. Come to me, my Heart will beat before the Father, the Son and the Holy Spirit. Priests, my beloved sons, be lights to your faithful. Pray much and encourage people to pray. There are many faithful who would like to pray together but who do not have a spiritual director because some priests do not listen to their needs. The groups without guidance are in danger of going astray. Do not fear the extra work; prayer must not be a burden for it brings blessings and joy. Pray, pray much for peace, for adversaries and for all those who have power. Lead the people into the life and work for peace. My Heart will help you! I bless all of you who rejoice in visiting me and all those whom you carry in your Hearts, especially the priests.
" All you who have followed my invitation, I greatly rejoice with you. Priests, my beloved sons, you are a special joy to me, because there are always several of you at my shrines. Praise the Father with me who has loved the world so much that He has given His Son for the salvation of the world. Praise the Father with me for He has chosen me as the Mother of His Son. Let us praise the Son who has given you unto me, for you are my children. Praise the Father through the Son who sends the Holy Spirit who strengthens and inspires you. May today's journey, all your prayers and the Sacrifice of Holy Mass be your offering in honor of the Holy Trinity and a thanksgiving to my Heart. Rejoice over Divine Mercy and over me, your Mother. Today, I bless you with special joy. Kurescek, September 7, 1991 The Queen of Peace gave as a commission the construction of a big, new church.
" This church shall be dedicated to the Most Holy Trinity. In the vicinity shall be a home for the Community of the Hearts of Jesus and Mary. Our Lady showed the place where the church shall be situated and the place for the Stations of the Cross. There is no escape from personal and national trials without prayer and fasting. Again I invite you to pray and to fast. Be a light, live my messages. I bless you and all those who accompany you from their homes and have recommended themselves to your prayer. Today you are few in comparison with the great number of people who usually bring joy to my Heart and to the Heart of my Son. The disobedience of the people of GOD towards its Creator has caused much disaster in history. Ignorance towards the signs of the time is like the walking of a blind man in an unknown place. Some did not recognize the signs, this is why the dragon has begun to spit the fire of evil. Wake up, recognize at least now where your salvation is! Pray, fast, renounce and offer your pains and yourselves to God on the altar. Sacrifice and offer up your gifts for my intentions, so that my Heart and the Heart of my Son may begin to reign in the world. Submit your desires to the Holy Will of God, so that you won't impede the coming of God's peace into your own hearts, into the hearts of individuals who are waging war with one another and into the nations who are waging war with one another. My Heart still especially invites you priests, my beloved sons, to recognize the signs of the times. Be the light of God unto the people, not darkness. Do not abandon prayer, otherwise you will not see the signs. Care for the purity of your thoughts and actions, of your souls and bodies. Daily consecration will attract believers and unbelievers. If you do not withdraw from my Heart you will feel my presence. I am your Mother, therefore I will not abandon you. Cooperate with my Heart! I bless you all, especially those who suffer. Enter into my Heart and into the Heart of my Son and strengthen yourselves with perseverance and peace. For the sake of peace perseverance in ardent prayer, fasting and repentance is needed. Offer up your sufferings and invite the sick and the handicapped to offer up their sufferings, so that instead of hatred and terror, love will begin to reign. The reason that the dark powers who sow terrible disaster among you are always becoming stronger is the disrespect for GOD's wishes, which are also my wishes. Live the Gospel and my messages which are a special grace for you in these times. Priests, my beloved sons, do not doubt me and my help. Be careful about how you shepherd your flock. Be their light! I bless all, especially those of my children who are obedient to me and who work for peace and offer up their crosses for its sake. Do not forget that I am your Mother and the Queen of Peace and believe in it.
" My Heart is sad because there is so much hatred and lack of peace on the earth. Yet I rejoice that the number of my children who are faithful to me increases. Pray, so that you may become capable to understand the voice of the Gospel and that the world may see my hand reaching out to it. My dear daughters and sons, today I have a special wish which you shall communicate to the world. Protect the Holy Father John Paul II through prayer and fidelity. Pray for the unfaithful Cardinals, the unfaithful Bishops and Priests who sow dissension, cause scandals and unfaithfulness to the Holy Father, the Church and to God. John Paul is my most beloved son. Listen to him and there will be more peace, unity and blessing in the Church and in the world. Priests, my beloved sons, neglect of prayer is the cause of your faint-heartedness and of the deviation of many. May prayer be a need for you and not a duty, for it is the source of strength and blessing. I bless all of you who endeavour, especially the suffering and the handicapped. Carry my blessings to all the lonely ! " "... All the Mary's messages that she did not want to become publicly known at once are written in my diary. I will make them public verbally and in written form when the time comes. If God for some time gives me the necessary health, I will try to edit all messages into a book form, or somebody else will do it using my diary, which I will give to a very trust worthy person... "